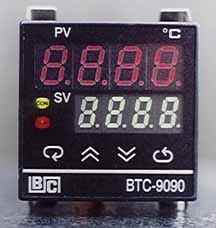 The BTC 2600 is a new generation miniature controller using the latest SMD technology. Assembly is fully automatic and the units are checked and configured by computer. Software has been refined over several years and offers a very logical menu structure and high noise immunity. Dimensions 48mm x 48mm x 94mm deep. Programmable Ramp 0 - 2000 C/Hour. The BTC 2600 is a very basic type of miniature controller , which allows you to program a single step eg. RAMP , TEMPERATURE , and a HOLD time . During the firing the ACTUAL and TARGET temperatures are displayed. This controller is a panel mounted controller suitable for all kilns using R Type (1300 degrees C ) and K Type ( 1150 degrees C ) thermocouple probes. Ph (09) 2336690 . Fax (09) 2336693.